Moose activity has picked up immensely here in the Adirondacks. Yesterday, the big fellow pictured here hung out in Tupper Lake for most of the day. 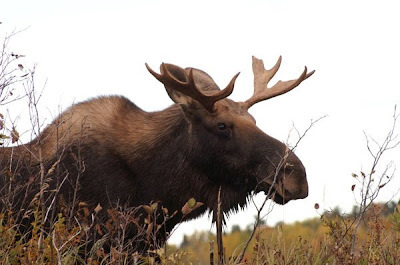 If you read the article linked here in this post, you'll see that some people approached the moose and he charged. This is not unusual behavior for a moose. And based on what we've seen since the moose started their Adirondack comeback, this is not unusual behavior for humans. Despite my humble but best efforts, and all the public education publications produced by the New York State Department of Environmental Conservation, some humans still seem to have a death wish and approach these massive animals.